4presentation.net this time inspired by Doraemon. Doraemon is very well known from the past until now. Because the magic of magic bag that can provide what is asked for Nobita and doors anywhere can take anywhere requested Nobita or the other. 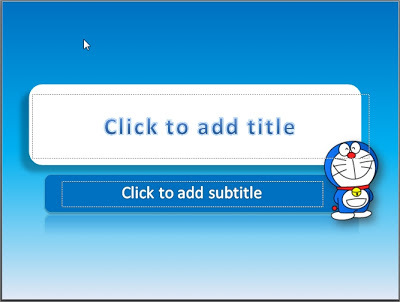 Powerpoint design looks interesting titles, such as color gradation dark blue, blue and white slightly, then use the font of the WordArt styles. Coupled two rectangles using a mirror effect and shadow makes a 3-dimension look as if arise.